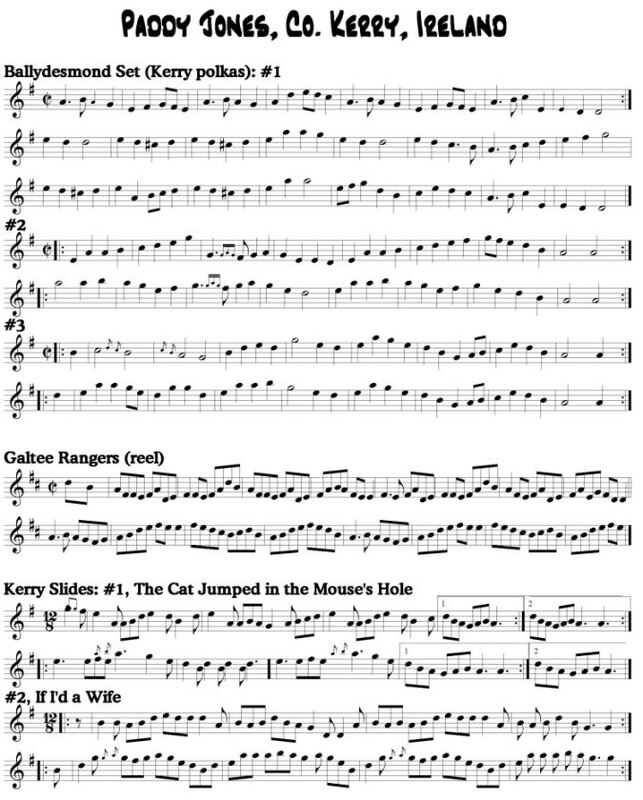 All tunes transcribed by Paul Tyler. Musical notation is only a guide to one way to play a tune. Use the written notes along with the recordings. If you hear something different than what is written down, good. Trust your ears. Play what you hear. Go here to hear some Paddy Jones tunes. Paddy Jones performed at the Fiddle Club of the World’s meeting on Friday, March 14 at the Leadway Bar & Gallery. 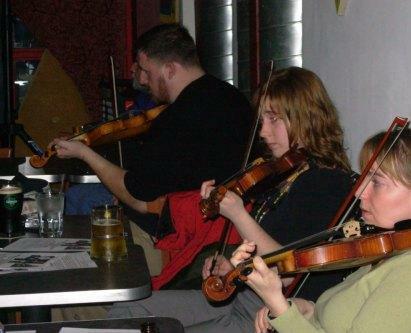 The Leadway Bar & Gallery was full of fiddlers last Friday night, for the first meeting of the Fiddle Club of the World. About 30 musicians showed up. Most had a fiddle and a bow. I counted one guitar and one banjo. And a handful of folks showed up just to listen. The music started about 8 pm, as we all played a few tunes together. 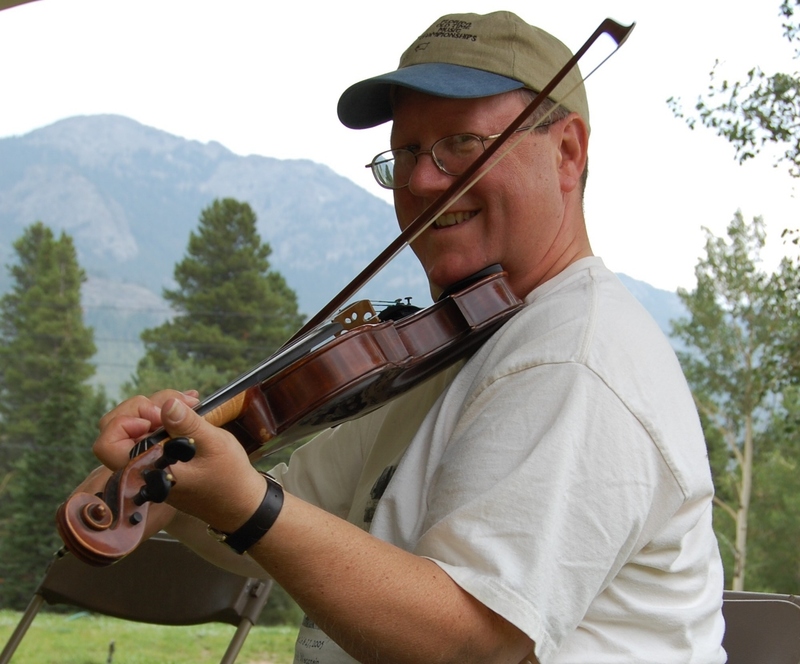 Since the Fiddle Club members come from various musical walks of life, I thought it valuable to talk about what people expect from a session. Old-time players jump on a tune and ride it till it finds its groove and finishes the course. You might play one tune through a dozen times. At Irish sessions, a tune is usually played two or three times through, and strung together with several others in a medley. Someone or most everyone knows what tune comes next. Bluegrass sessions start by establishing a rotation of lead breaks, and pass the tune around from one player to the next. 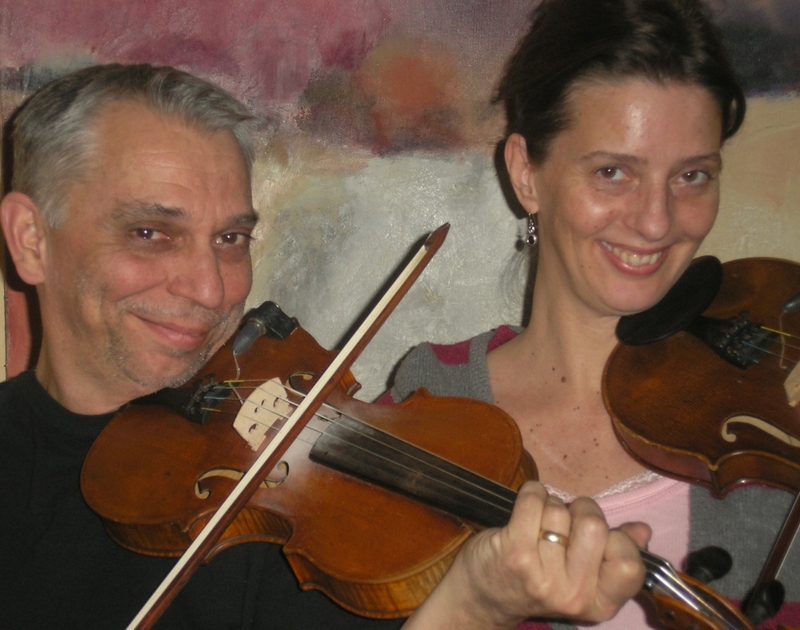 The Fiddle Club of the World has no established set of rules, but seeks to allow players to stretch boundaries and extend horizons to experience more of what fiddling can do for the world. Paddy Jones, a truly delightful man and musician, got started about 8:30. He was artfully accompanied by Jesse Langen, who arrived just in time after a gig with the proprietor of Chief O’Neill’s pub. Paddy’s playing was strong, sensitive and rhythmic. He enthralled the room. After close to an hour of concertizing, Paddy was ready for a break. He said he was used to having a singer step up with an occasional song, so he could rest his bow arm for a few moments. We’ll keep that in mind for future meetings. Everybody got to play. We went through the tunes posted ahead of Paddy’s visit–the Kerry Polkas, the Kerry Slides, and the unnamed reel that is, in fact, The Galtee Rangers. Jessica Zeigler and her students from Old Town School Irish fiddle classes led us through some standard Irish session tunes. We ended sometime after 11 pm. And that’s how the Fiddle Club of the World (Chicago Chapter) begins. The party room at the Leadway is a bit bigger than I thought. We’ve opened up space for six more members. Please note a slight change in the schedule for the evening. In the interests of Paddy’s accompanist being able to show up on time, we’ll start about 8ish. And we will begin with a bit of a session, to try to find some common ground between the enthusiasts for Irish trad and the old-time crowd. Paddy’s concert set will start at about 8:30. Around 9:30 we’ll have a big session and play the tunes that are posted here for you to learn. And then we’ll have some more tunes. Also note. Space is limited. We have room for only twenty members. As I write this, there are just two slots still available. If you want to bring a guest, you’ll have to sign them up for the Club. Hurry. It’s first come, first served. I might have to look for a bigger space for the next meeting. 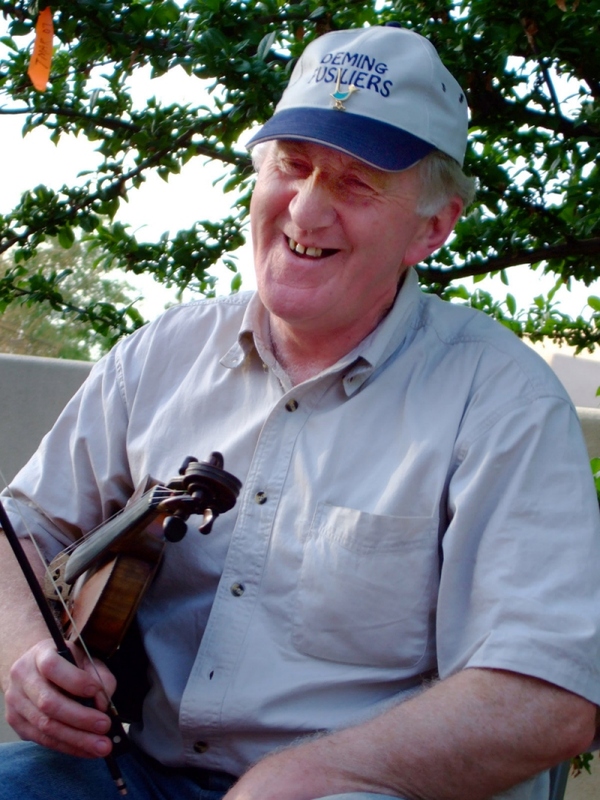 Paddy Jones is one of the last pure players of the traditional music of Sliabh Luchra (pronounced Shleeve Lew-cra), a mountainous region on the borderland between Counties Kerry and Cork in the southwest corner of Ireland. The distinctive style of this region makes heavy use of polkas and slides, and relies less on the reels and jigs that are more standard in the “trad” Irish repertoire. The undisputed master of the Sliabh Luchra style was the legendary Padraig O’Keefe, who was Paddy Jones’ teacher. 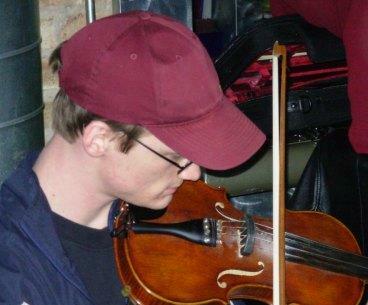 Traditional tunes from downstate Illinois and beyond are the forte of this fiddler long known for his work with the Volo Bogtrotters. Chirps now plays with the New Bad Habits. Go here to hear some Chirps Smith tunes. Go here to hear some Whedbee tunes. Sign up quick. Find workshops here. All tunes were performed by Paddy Jones with Rus Bradburd at a concert in Silver City, New Mexico in 2007. Recording courtesy of Rus Bradburd. Go to Paul Tyler’s transcriptions of these Paddy Jones tune. Paddy Jones will be performing at the Fiddle Club of the World’s meeting on Friday, March 14 at the Leadway Bar & Gallery. For now, the Old Town School is handling the club meetings as if they were workshops. Call 773.728.6000 to register. Cost is $12. Your name will then be entered on a list that allows entrance to the club meeting. Only those registered for the workshop will be considered members. Space is limited. Register early. To hear some Paddy Jones tunes.